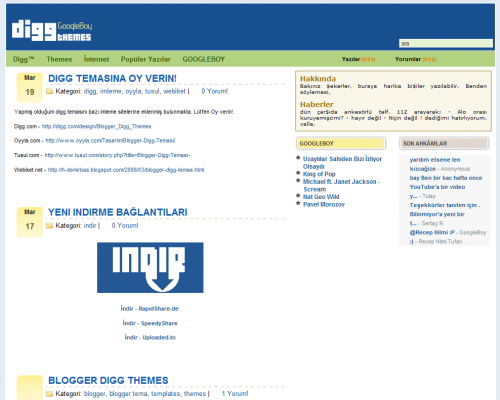 Now a days its not a difficult task to get your desired blogger templates. You can get blogger templates on almost every topic and if you are not getting one, here are few designers who can design blogger templates for you. In this post, I am lisitng few blogger templates based on famous social networking sites. So if you love any of the social networking sites like Facebook, Twitter or Digg you can use these templates on your blog. 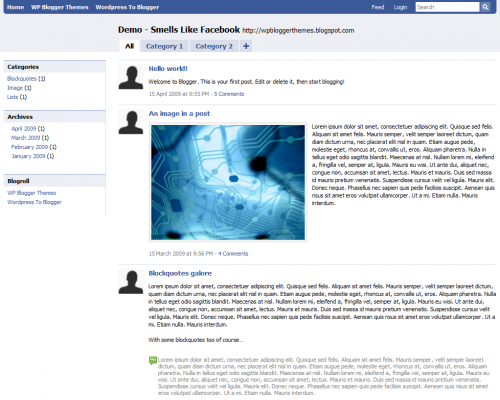 Smells like Facebook is a blogger template which is a exact clone of famous social networking site facebook. This theme was originally ripped by Nazieb for wordpress blogs but later it is converted to blogger template by WordPressToBlogger. 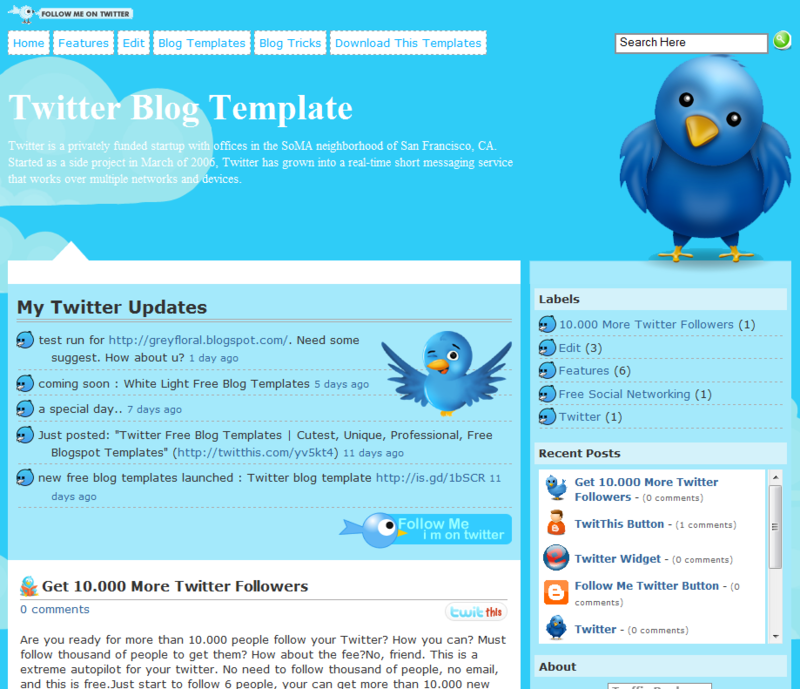 Twitter blog template is simewhat simliar to twitter but its not the exact clone of it. 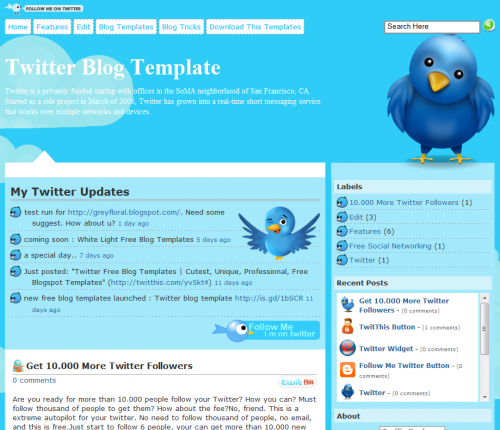 Twitter lovers can use this template on their blogs to show off their love for twitter. Digg blogger template can make anyone think twice whether he’s on digg or your blog 😀 Its very nicely ripped theme. Its exact clone of Digg. Anshul Dudeja has designed a blogger template based on the theme of Orkut. 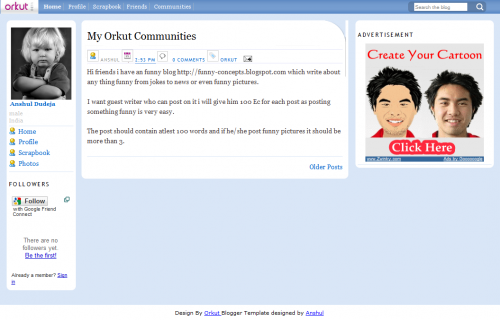 It is best choice for those who are blogging about orkut and other tricks related to orkut. If you have any other blogger template based on social networking sites, you can ask us to list in this post. It’s really cool template, Dear. Hope I can use it for my next blog. Some nice looking templates you listed above. If you download them, you will need to customize it a bit to make it look different. To give it your own signature, make it unique and not just be a duplicate layout. These are really hot, man didn’t knew bout 2 of them. Thanks buddy. .-= Bariski´s last blog ..20 Fresh & Awesome Text Effect Tutorials Using Photoshop & Illustrator (2009) =-. Twitter design is awesome. thanks. .-= abi´s last blog ..Soccer Gear =-. .-= wayne´s last blog ..Samsung Go N310 Midnight Blue Netbook =-. heyyyyyyyyyyyyyyyy dude wonderfull post like it very much amazing thanks for it………. .-= smsformobile´s last blog ..never say u r happy when u r sad =-. .-= wawan´s last blog ..Watch Top Gear Season 14 Episode 6 / Top Gear (14×6) Download =-. You have nice templates. I like the twitter template.. I also like your other templates especially the Comfy Blogger Template..
.-= ticklethythoughts´s last blog ..High Bulging Forehead: Sign of Superior Intelligence? =-. nice collection, digg and facebook clone template were really close and nice.